I should have headed the warning of the other reviews here on zocdoc. The doctor was perfectly nice and relaxed, butthe facility was in utter ruins. I don't think I could return there with my newborns. I mean it was dirtier than the subway. Yuck. I should have headed the warning of the other reviews here on zocdoc. The doctor was perfectly nice and relaxed, but the facility was in utter ruins. I don't think Icould return there with my newborns. I mean it was dirtier than the subway. Yuck. I wish the office wasn't so dirty and beat up. The people were kind, but giving your child shots in abuilding covered in dirt isn't comforting. I wish the office wasn't so dirty and beat up. The people were kind, but giving your child shots in a building covered in dirt isn't comforting. As your Pediatrician, Dr. Carvan's goal is to provide the best pediatric care to your child and to assist you and your family in raising healthy children. Dr. Carvan is a certified American Board of Pediatrics physician who can treat your child for an annual physical, ear infection, hearing problems, sinus problems, fever, general pediatric consultation, sore throat, baby check-ups, and more. 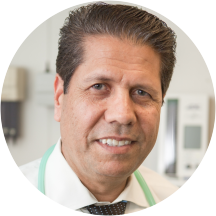 Dr. Carvan is excited to treat his new and existing patients everyday with the best care possible! Staff is very nice... office needs a make over. Looks scary but the staff is professional. If you prefer nice looking places you shouldn't go here. The facade and clinic definitely have some aesthetic challenges. But if you can get beyond the appearance, Dr. Carvan and the staff are great! THEY DO NOT ACCEPT CREDIT OR DEBIT CARDS for copays. This is very inconvenient. The docftor was very nice and good listner. Eventhought my daugter cried a lot because of the shots, I definetly recommend him. Love this doctor ! Love that my daughter can be seen on the day she is sick ( I don't have to predict a day that she will come down with something like other offices who can't see children without appointmentsmade in advance.) Answers calls right away and calls in any medicine I've needed. Great doctor and happy he's a very short walk away! Dr. Carvan is polite but brief and quick. You almost feel rushed when with him. Each appointment lasted no more then a few minutes. I just don't feel like like that's enough time to assess my baby or anyone's needs andit just makes bad bedside manner. That said, he did have me wait an hour in front if his office for a last minute walk in appointment with a insurance sales associate. Even the staff in the front kept trying to remind he had patients. In the end I feel his pocket is more important to him than his patients. The most significant reason for us to seek another physician however is the place itself. The office is so dirty - and I mean caked with dirt! I just can't help but feel this attention to their environment reflects on the care you'll receive. Very professional, calm and gentle with my newborn baby. Great experience! Thank you, Doctor. Very good doctor! Very good with examining not just going by what "meets the eye." Feel like I can trust his judgement with my daughter. He will be our primary doctor for a while! Informative and friendly. Pity he was running a little late but it was a comfortable wait. Nice helpful staff.